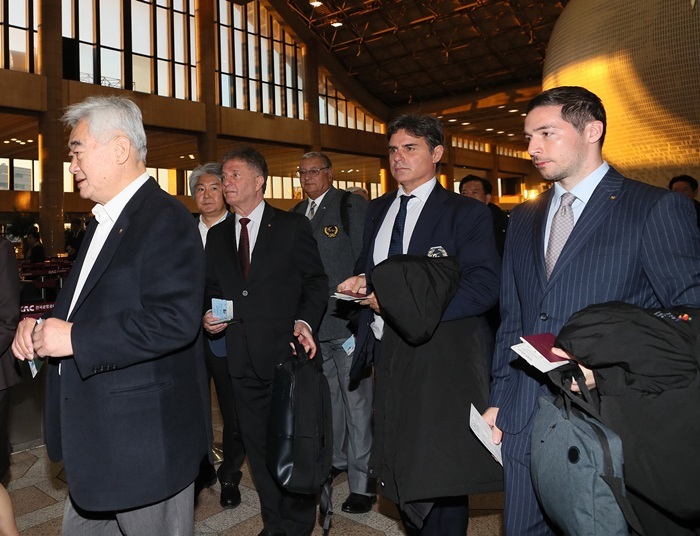 Members of a South Korean taekwondo delegation led by World Taekwondo (WT) President Choue Chungwon (left) on Oct. 30 depart for North Korea from Gimpo International Airport. A WT demonstration team will perform in Pyeongyang on Nov. 2 with the North Korea-affiliated International Taekwondo Federation (ITF). The reconciliatory mood in inter-Korean relations has helped expand sports exchanges on the Korean Peninsula. This year’s summits between President Moon Jae-in and North Korean leader Kim Jong Un are raising inter-Korean diplomacy through sports. Both Koreas in May fielded a joint women’s team at the Liebherr World Table Tennis Championship 2018 in Sweden and held an inter-Korean soccer match in August. The two sides also entered the opening ceremony of the Asian Games 2018 in Indonesia together and formed unified teams in three events. And in September, North Korean athletes competed in the ISSF World Shooting Championship in Changwon, South Korea. Two sports seeing especially keen cooperation between the two Koreas are taekwondo and youth soccer. The WT demonstration team of South Korea flew to Pyeongyang on Oct. 30 at the invitation of the ITF, WT’s traditional rival. Comprising 49 people including members of the demonstration team and WT council as well as South Korean journalists, the delegation will return to Seoul Nov. 3 after a five-day stay. The demonstration team performed on Oct. 31 at Taekwondo Hall in Pyeongyang and will also hold another demonstration there jointly with a North Korean team on Nov. 2. This is the second joint taekwondo demonstration between the two Koreas since the first in April this year. North Korean soccer players on Oct. 29 greet their counterparts from South Korea’s Gangwon-do Province after winning the opening match of the fifth Ari Sports Cup at the main stadium of Songam Leports Town in Chuncheon, Gangwon-do Province. 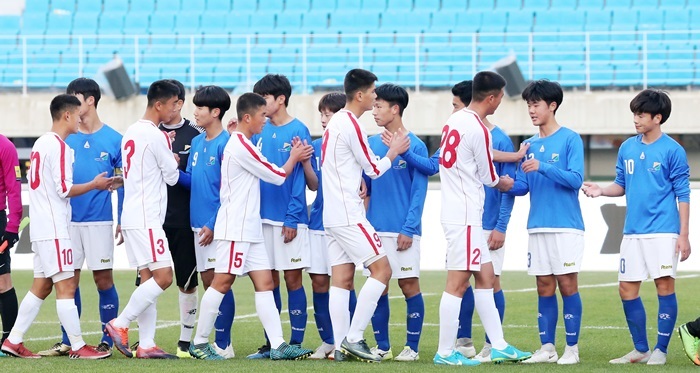 Youth soccer is also seeing brisk inter-Korean exchanges, with a soccer match taking place on Oct. 29 at the fifth Ari Sports Cup in Chuncheon, Gangwon-do Province. At the main stadium of Songam Leports Town, the North Korean team beat a squad of South Korean players from the host province, 3-1, in front of 15,000 fans. The holding of the game itself was considered to have stronger meaning than the final score. Athletes from both sides said they felt as if they were from one nation. Founded in 2014, the Ari Sports Cup is an international U-15 soccer tournament co-hosted by the Korean Sports Exchange Association of the South and the April 25 Sports Club of the North. A combined 230 athletes from six teams participated in this year’s event. The six teams included youth squads from the two inter-Korean sponsoring clubs and others from China, Vietnam, Uzbekistan and Iran. The teams are put into two groups and play a combined 20 games. This year’s tourney was held at stadiums in Chuncheon and Inje, Gangwon-do Province.